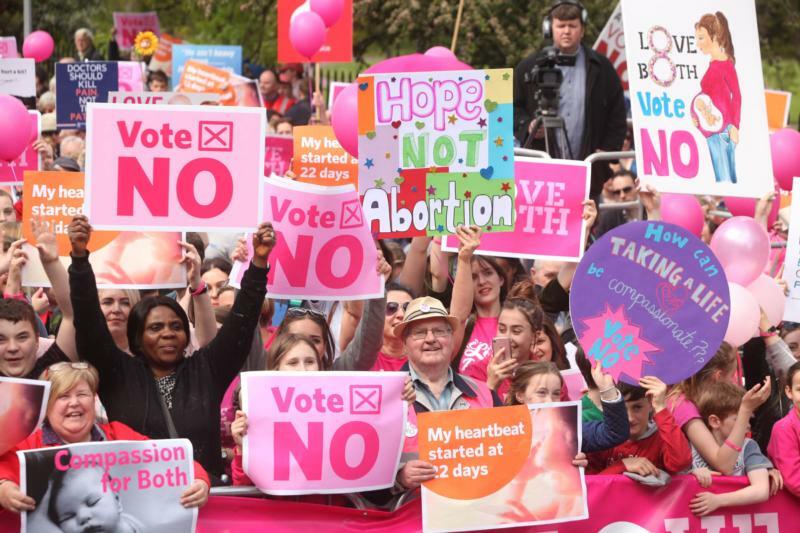 DUBLIN (CNS) — In the last major pro-life rally ahead of Ireland’s May 25 referendum on whether to liberalize the country’s abortion laws, thousands gathered to say “no” to far-reaching proposals that could see abortion on demand up to 12 weeks, and even later in some cases. In less than two weeks, people in Ireland will be asked if they wish to repeal Article 40.3.3 of the Constitution, known as the Eighth Amendment, which enshrined a ban on abortion in 1983 and gives equal right to life to the mother and the unborn child. The Irish bishops have warned that if the Eighth Amendment is repealed, legislation the government plans to introduce would make Ireland one of the most liberal abortion regimes in Europe. Among the speakers who addressed the weekend rally in the shadow of the Irish parliament on Dublin’s Merrion Square was Mary Kenny, 24, a single mother from Pallaskenry. She believes the Eighth Amendment saved her daughter’s life. Instead, Kenny believes the near total ban on abortion in Ireland gave her time to think about her pregnancy and opt to keep her baby. “My first thought was abortion. I looked up the British Pregnancy Advisory Service (BPAS) and decided that I would travel to England to end the life of my small baby,” she said. She would have been one of the 3,265 Irish women who annually make the trip across the Irish Sea to Britain for an abortion. However, she discovered her passport was out of date, so she could not travel. “I became frantic and I ordered abortion pills online,” she explained to Catholic News Service. Holly arrived Nov. 19, 2013. Kenny continued with her college studies and has since secured a degree in technical communications and electronic learning at the University of Limerick. While polls indicate that the “yes” campaign to repeal the Eighth Amendment currently polls at 45 percent of voters, the gap between the two sides has been narrowing in recent weeks, with 34 percent saying “no” and 18 percent of voters still undecided. Nearly 4 percent gave no opinion. Gavin Boyne, 20, a student of philosophy at Trinity College Dublin, told CNS he is strongly opposed to a repeal of the Eighth Amendment, which he believes saved him from being aborted. Someone else who knows the challenge of being pro-life on campus is 21-year-old Katie Ascough. She was impeached as University College Dublin’s Students Union president over her decision, following legal advice, to remove information from the student union handbook on procuring an abortion. Tracy Harkin’s fifth child was diagnosed at birth with Trisomy 13, a severe life-limiting condition. “We were told at that time that she was incompatible with life and that over 90 percent [of] children diagnosed with this don’t make to a year old. But Kathleen has defied all medical expectations, and she is still with us today at 11 years of age. She is our little miracle,” said Harkin, 43, of County Down. Harkin is a member of the support group Every Life Counts, which assists parents whose children are diagnosed with a life-limiting condition. If the referendum passes, she believes the impact on children with a disability will be dramatic. “Unborn children with special needs will be eradicated. It is heart-breaking for me, because I think special needs people bring so much to our families and our communities; they are a blessing. They teach us how to love and they bring out the best in us,” Harkin said.